Mike Neustrom began his career in the U. S. Navy serving as a diplomatic liaison with U.S. embassies and consulates in foreign ports. 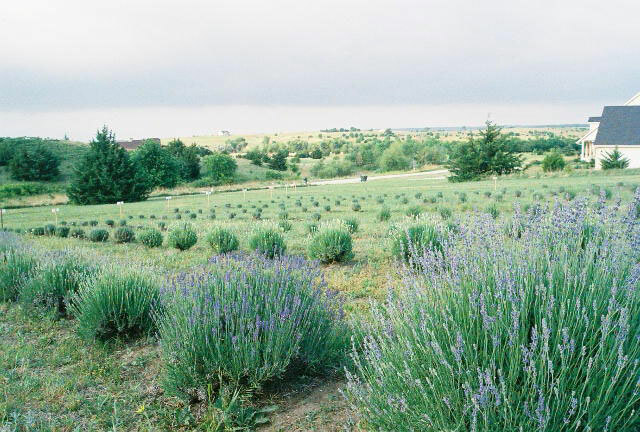 Now he grows lavender in Kansas on Prairie Lavender Farm. Check out his website. When you see the images of the neat “ship-shape” rows of lavender growing on his farm, it is easy to imagine him in his navy uniform. Mike now applies the discipline and organizational skills he learned in the Navy to growing lavender. Prairie Lavender Farm, founded in 2002 on the high plains in north central Kansas, is home to 3500 lavender plants. Situated on 6 ½ acres on the south side of a hill above the Dakota Aquifer, the growing conditions match lavender’s three requirements: full sun, well-drained, alkaline soil. About half of the lavender plants are Lavandula angustifolia varieties, (sometimes called English lavender), the rest are Lavandula x intermedia (hybrids). 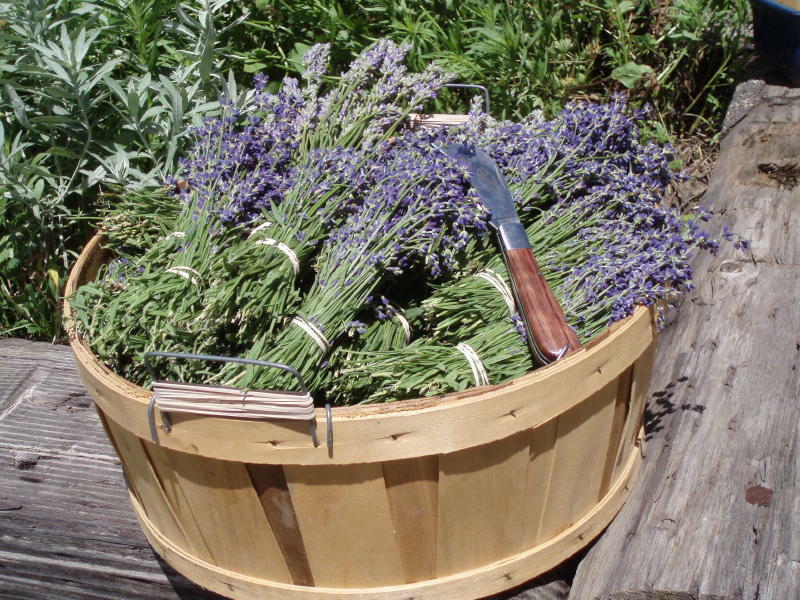 Prairie Lavender Farm has lavender blooming from June through October with as many as four or sometimes five cuttings. Mike retired from the Navy plus one more career before lavender began its campaign to win his affection. Mike was seduced by lavender at a roadside market. “By shear accident, I’d gone by a little roadside farmers market in Salina, Kansas. I noticed herb plants for sale. I ended up buying four or five flats of lavender, took them home and planted them in rows,” Mike said. That was how it began. Lavender fascinated Mike. He wanted to find out where it fit in the botanical world, its history and how the herb was used. 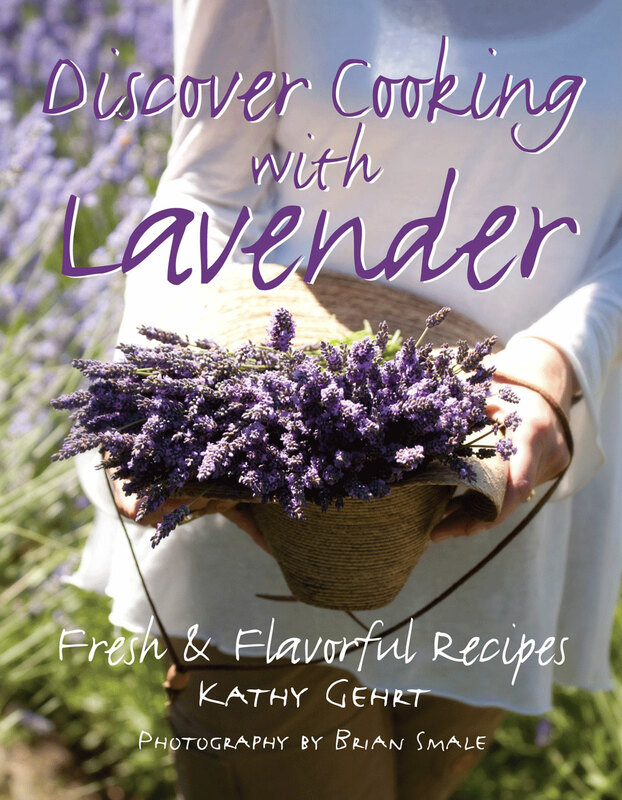 When Mike went to visit his sister Carole near Austin, Texas, he met Sharon Shipley, author of “The Lavender Cook Book” and coincidentally, Carole’s business partner. 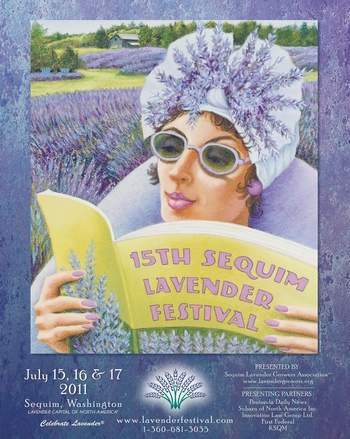 Sharon was in Austin to speak at the first Southwest Lavender Conference. Mike attended the conference where he met lavender growers and lavender nursery owners. When he returned to Kansas, he had several hundred Buena Vista lavender plants from Cathy and Sam Slaughter’s Gabriel Valley Farms. To learn more about lavender farming, Mike traveled to Idaho and visited with Al and Peggy Armstrong at their Valley View Farm. He asked them about harvesting, making and packaging products and marketing. 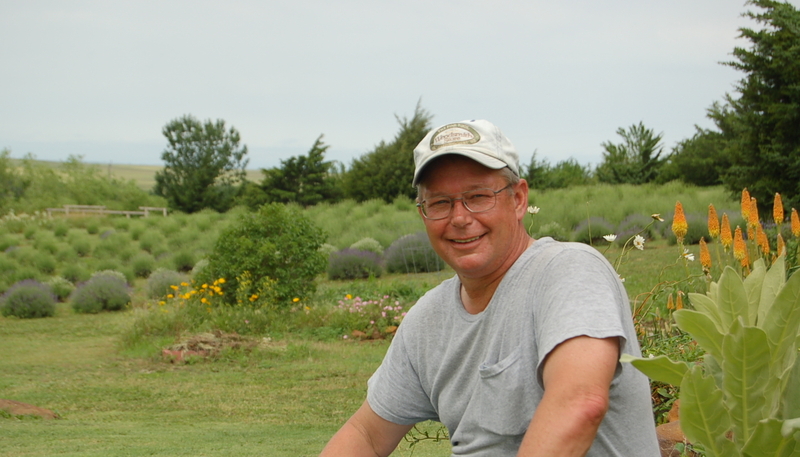 After running Prairie Lavender Farm for the past eight years, Mike still enjoys this labor of love. I caught up with him via telephone last week. He’d just closed his gift shop for the day, and agreed to talk to me about his farm. Earlier that day, he’d hosted two large groups. An RV group, 22 people in all, had stopped by to see the lavender in full bloom on this June day. They’d been at the Kansas Smoky Hill River Festival and had heard about Mike’s farm from a nearby winery. Many people discover Prairie Lavender Farm by “word of mouth.” Mike said, “I take them out, show them the fields, talk about the history and tell them about the farm.” Later that day, another group of 50 people came up from Wichita for a walk through Mike’s fragrant fields and a visit to his gift shop. Once, a group of wheat farmers visited the farm. “You know they were dragged out here by their wives,” Mike said, “and they were fascinated with growing and farming aspects. I told them that they quit too early.” On this farm, Mike doesn’t quit until all the lavender is grown, harvested, distilled, dried, and then used to make products that are sold in Prairie Lavender Farm’s gift shop, online or at several retail shops. “We make everything on the farm,” Mike added. “I want to know what goes into every one of my products.” Best selling items are Prairie Lavender Room Spray, Premium Lavender Body Lotion and Lavender Body Butter. He has developed 80 products, all using lavender. Mike loves to cook with lavender. His favorite variety for culinary use is Buena Vista.“I like its sweet flavor. Some people use Provence, however I prefer Buena Vista for its taste,” said Mike. The herb blend, herbs de Provence, is the seasoning he sprinkles on chicken, pork or fish. Mike cooks chicken seasoned with herbs de Provence in a crock-pot and loves the delicious aroma that greets him when he comes in from the farm for dinner. 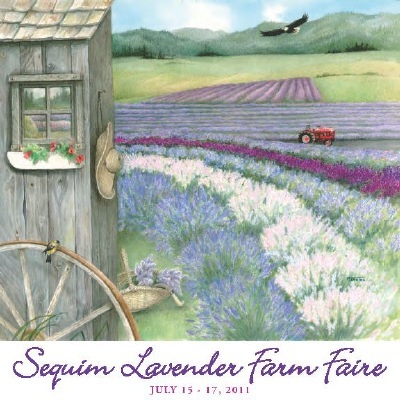 This Saturday, June 18th, Prairie Lavender Farm hosts its 3rd Lavender Festival. Here is a list of activities. Sounds like a great way to spend the day! As my conversation with Mike came to a close, I asked Mike what he likes most about his career as a lavender grower. Mike paused, “I am happy to say ‘I haven’t had to sit through even one meeting over the last nine years.’” Who could have guessed that a twenty-year career in the navy would be the perfect preparation for creating a successful lavender business?